The Cebu-Cordova Link Expressway (CCLEX) is on track to be finished by mid-2021 and will transform the economy and social landscape of Cebu, according to officials of the company undertaking the project. The Cebu Cordova Link Expressway Corporation (CCLEC) signed on February 7 a P19-billion loan and security agreement with 6 banks: Rizal Commercial Banking Corporation, Development Bank of the Philippines, Robinsons Bank Corporation, Union Bank of the Philippines, Bank of the Philippine Islands, and Security Bank Corporation. 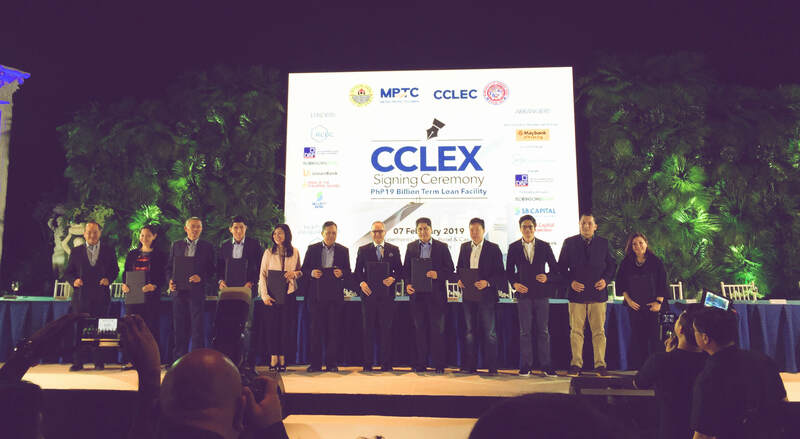 CCLEC is a subsidiary of the Metro Pacific Tollways Corporation (MPTC). The total project cost of CCLEX is projected to be P30B. The rest will be funded by MPTC through equity or supplemental loans, said MPTC President and CEO Rodrigo Franco. LOAN FACILITY. Representatives pose with the finance documents after the signing of the P19 billion loan agreement. CCLEC President and General Manager Allan Alfon said in welcoming guests to the signing that he looked forward to the ceremonial drive-through to mark the opening in a little over 2 years. Construction of the CCLEX started last July 5 and all 21 piles of the main bridge’s Tower 2 have been completed while 17 of the 21 piles at Tower 1 have been constructed. These, the company said, form part of the bridge’s main foundation. Cordova Mayor Mary Therese Sitoy-Cho said her town has been preparing its people and implementing infrastructure projects ahead of the completion of the 3rd bridge. “First, it reflects our philosophy that government should only provide a service that the private and civic sector are unable or unwilling to do so. Metro Pacific and all the other entities are willing to fill a need so please go ahead then we can reserve our resources for the other needs of our citizens.” Fernandez said. “This was approved by the previous administration and continued by the present administration and today it is receiving unanimous support from the council and all the other government and non-government agencies. It is a fantastic example of what unity can do,” he said. “Most of all, it is outstanding because the taxpayers do not pay for this project, it is the users. Those people who are not willing or are unable to use this project, they do not have to pay for it. In fact, the City of Cebu and the Municipality of Cordova are not going to spend a single centavo of taxpayers’ money for the bridge,” he said. Instead, they will earn from this project. MORE INFRA PROJECTS FOR CEBU. Secretary Adelino Sitoy of the Presidential Legislative Liaison Office talks about other infrastructure projects being undertaken in preparation for the 3rd bridge. Sitoy said P187 million has already been released for the project with a further P400 million to be disbursed soon. He said what is needed after this would be a skyway to connect the bridge to the passenger terminal of the Mactan Cebu International Airport. And there’s more, said Sitoy, who shared that he had been dreaming about the 3rd bridge for close to 30 years. “We look forward to another bridge, to Getafe in Bohol from Cordova,” Sitoy added.